This new functionality may help you in several situations: if you’ve just launched a new site, or added some key new pages, you can ask Googlebot to find and crawl them immediately rather than waiting for us to discover them naturally. You can also submit URLs that are already indexed in order to refresh them, say if you’ve updated some key content for the event you’re hosting this weekend and want to make sure we see it in time. It could also help if you’ve accidentally published information that you didn’t mean to, and want to update our cached version after you’ve removed the information from your site. First, use Diagnostics > Fetch As Googlebot to fetch the URL you want to submit to Google. If the URL is successfully fetched you’ll see a new “Submit to index” link appear next to the fetched URL. Once you click “Submit to index” you’ll see a dialog box that allows you to choose whether you want to submit only the one URL, or that URL and all its linked pages. When submitting individual URLs, we have a maximum limit of 50 submissions per week; when submitting URLs with all linked pages, the limit is 10 submissions per month. You can see how many submissions you have left on the Fetch as Googlebot page. Any URL submitted should point to content that would be suitable for Google Web Search, so if you're trying to submit images or videos you should use Sitemaps instead. In conjunction with this update to Fetch as Googlebot, we've also updated the public "Add your URL to Google" form. 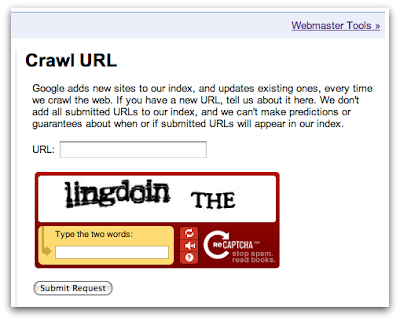 It's now the Crawl URL form. It has the same quota limits for submitting pages to the index as the Fetch as Googlebot feature but doesn't require verifying ownership of the site in question, so you can submit any URLs that you want crawled and indexed. Note that Googlebot is already pretty good about finding and crawling new content in a timely fashion, so don’t feel obligated to use this tool for every change or update on your site. 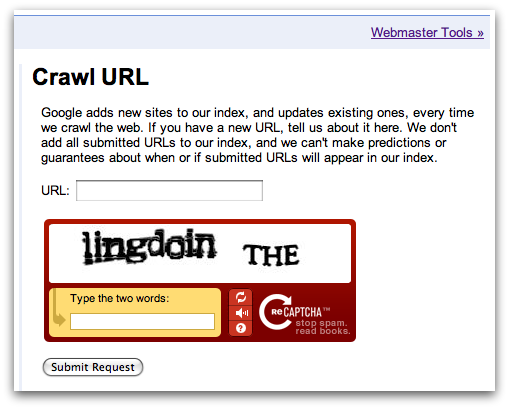 But if you’ve got a URL whose crawling or indexing you want to speed up, consider submitting it using the Crawl URL form or the updated Fetch as Googlebot feature in Webmaster Tools. Feel free to comment here or visit our Webmaster Help Forum if you have more detailed questions.